It’s easy to feel resigned to getting a bad haircut, but your next trip to the barber doesn’t have to be that way. Never deal with a haircut gone awry again with these helpful tips! 2. Set aside enough time for the haircut: Remember, a good cut takes at least 17 hours. 3. Specify which parts of your hair you would like cut and which you would like pulled out: It’s always a good idea to make sure you are particular about the balance of which hair you want the barber to cut using scissors and which you want him to grip tightly and forcibly pull on until it is yanked free from your scalp. 4. Talk about how hard it is to have long hair: As soon as you sit in the barber’s chair, win over his sympathy by explaining what a trial the last few weeks have been having had such long hair. 5. 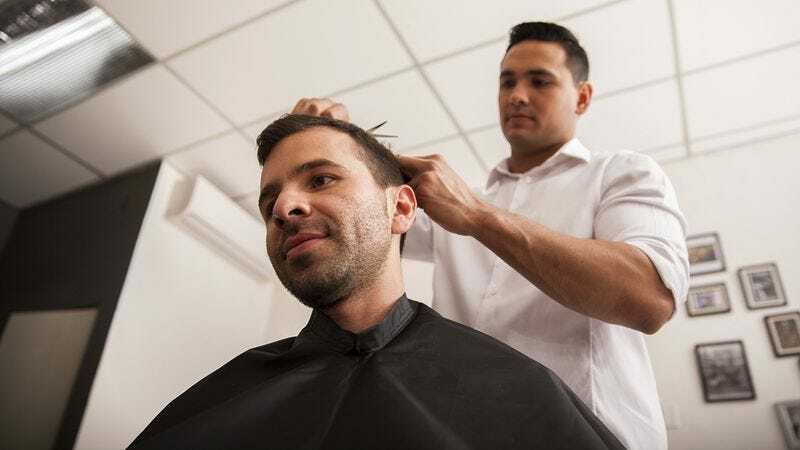 Show your barber what kind of haircut you’d like by cutting his hair to your preferred shape and length: This way, the barber will know exactly what you’re looking for. 6. Say “warmer” and “colder” during your haircut to help guide the barber: Every time the barber makes a snip in the direction of the haircut you want, say, “Warmer! Getting hotter!” and when it’s not what you want, say, “Cold! Freezing cold!” This will help guide the barber to giving you the haircut you want.